We all have our private, personal memories, but here in Wotton we are surrounded by many memorials and signs of various kinds which evoke memories of the events that have helped to shape the town. The Tolsey Clock in the High Street is a reminder of Queen Victoria’s Diamond Jubilee in 1897. The Tolsey building on which it is perched was given to the town by the Countess of Warwick in about 1600. It was used as a Court House with a prison cell or “blind house” in the cellar below. Down the road on a house in Long Street is a date stone of 1748 with the initials S E W. These are the sisters Susanna and Elizabeth Wallington. The house was divided into two, each sister owning half. The Wallington family was long established in the town. Many were involved in the wool trade as merchants or mercers and several were Mayors of the town. Others were landlords of various inns, including the Vine Inn in Long Street which is now Lloyd’s Bank. The kettle over the former “Harvest Store” in Long Street seems an odd emblem for a grocery shop. Originally Plomer’s Brazier and Tinplate works, the shop front was altered but the kettle remains. In Orchard Street one finds a marble plaque on Orchard House dedicated to Sir Isaac Pitman. Coming first to Wotton as a teacher at the British School (earlier in Bear Street but now along the Wortley road) he later set up his own school originally in Symn Lane and then in Bradley Street. He invented his “phonography” or shorthand in 1837 while living in Orchard Street. He later moved to Bath. In the parallel street, Clarence Road, stands the Dramatic Society’s Green Room. The original building, part of which had been the American Army’s skittle alley during the war years, became unsafe and was demolished. Mrs Bessie Morley unveiled the plaque to open the Green Room in June 1985. On the corner of Ludgate Hill with Church Street is a plaque with the date1659. This appears to refer to the Falcon Inn but may have been on cottages which were later incorporated into the inn. In Church Street there is a memorial scroll over the entrance to the alm- shouses remembering Alderman Perry who, in 1634, bequeathed money to build the almshouses. Additions by Thomas Dawes were made later in the1700s. The scroll contains the town’s original emblem – a woolsack. The town’s War memorial, erected in 1920, stands in Old Town. Mrs Cor- nock pulled the cord to unveil the monument. Eight of her sons served in WWI and three did not return. The names of servicemen killed in WWI and WWII are inscribed on the memorial. Along the Culverhay outside St. Mary’s Church to the left of the entrance stands the Calvary. This was erected personally by Rev. Frederick Greenham (Vicar of Wotton 1907 – 1923) also as a war memorial. Sadly he had had some disagreements with the town authorities over arrangements for the official town memorial. Inside the Church the numerous memorials deserve a book of their own. Suffice here to mention the brasses on Lord and Lady Berkeley’s tomb – some of the finest in the country – and memorials to various Tatter- shalls including Rev. William Tattershall, Vicar of Wotton from 1778 to 1829. On the organ is a plaque noting that originally it was a gift to St. Martin-in- the-Fields in London from George I. 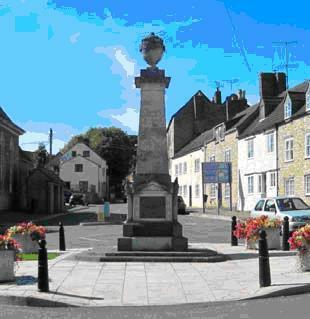 It was acquired for Wotton in 1800 by Rev. Tattershall for a sum of £200. It is thought possible that Handel played the instrument. Two small windows in the porch remember a much-loved Vicar, Rev. Frederick Sillett (1963 – 1969). Over the porch a sundial dated 1799 recalls the Biddle family, relatives of John Biddle (1615 – 1662) a Wotton man who is recognised as the Father of Unitarianism. Opposite the Church is another set of almshouses. A stone plaque on the end wall details Miss Ann Bearpacker’s endowment of the dwellings in 1837. The Bearpacker family were again prominent members of the community and were involved in the woollen industry and the legal profession. A walk along Coombe Road and up Rushmire Hill will bring you to a turn- ing on the right that leads to Coombe itself. Here there is a welcome seat with a circular plaque on the back to say it commemorates the coronation of Edward VII and Queen Alexandra in 1902. Wotton certainly looked after its own as a third set of almshouses is found on Tabernacle Pitch at the top of Old Town. At the far end of the row an ornamental scroll tells that they were erected by T.S. Child in 1815 in memory of Rev. Rowland Hill who came to Wotton as an itinerant preacher in 1771, loved the town and built himself a tabernacle and house here. The later Georgian style school room and Chapel (now the auction rooms) re- placed the earlier building. The Civic Centre adjacent to Bradley Street boasts two memorial plaques in the entrance on the car park side. Princess Anne opened the building in 1980 when it was Renishaw’s headquarters and Princess Alexandra came in 1997 to name it the newly refurbished Civic Centre. Returning to Market Street, a blue plaque commemorates the restoration of numbers 2 to 14 by builders Robert and John Woodward. The ancient houses and shops became dilapi- dated and were demolished. The work received the rare distinction of a European Architectural Heritage Year Award in 1975. Later the brothers constructed a replica of the Woodchester Roman pavement in the tabernacle. The Scroll of Honour listing all who served from Wotton in WWI is found in the Town Hall. Other memorials over the stairs commemorate services to the community by several well-known Wot- tonians. At the entrance another brass plaque commemorates the re-open- ing of the Town Hall after refurbishing in December 2004. The decorative panel by John Pinch containing the Town’s Coat of Arms was unveiled in December 2004. Other scrolls remember servicemen who died in WWII and in peacetime. More memorials are to be found in the Heritage Centre. Among them, the naming of the new fire engine “Firefly” in 1929 is recorded on a brass plaque and the opening of the Heritage Centre by Mr John Berkeley in 1995 is similarly noted. Last but not least, if your doctor’s surgery is on the corner of Synm Lane, you will find a plaque inside recording its opening in September 1986 by the Earl of Ducie, and down at Potters Pond, large notices on the end wall tell the origins of the Ram Inn, the oldest building in Wotton. Badman. Roy (1995) “Wotton’s Vicars” Wotton-under-Edge Historical Society. “Wotton’s Shops” Collection of photographs. Volume II. Wotton Heritage Centre. Masefield. G B. (1982) “Worthies of Wotton-under-Edge” Nimsfeilde Press Ltd., Nympsfield, Gloucestershire. Perry. R. (1986) “Wotton-under-Edge. Times Past - Time Present” Manor Print- ing Services (Wotton) Ltd., Kingswood, Wotton-under-Edge, Gloucestershire. Wotton-under-Edge Historical Society (2002) Millennium Book “Remember this? 100 years in Wotton-under-Edge”.